A $200 deposit reserves the puppy of choice. Come, See and Fall in Love with a Silver Harbor Havanese ! We own and operate Silver Harbor Pet Service. We have been in the pet sitting business since 2007. Our pet services include (but not limited to) basic training, daily walks, feeding, playing with your pet, grooming, and clean-up. You can rely on Silver Harbor whether you’re away for a few days or a few weeks. We also provide daily dog-walking services and pet taxi for those vet appointments you can't make it to! Give us a call, We are just a bark, meow, or chirp away! More From the Havanese Freestylers!! I strive to produce happy, healthy, and high quality pet Havanese. An exceptional puppy has an exceptional beginning and that is my goal. Silver Harbor puppies are wholesome family raised puppies with great life beginnings. I hope you will "Fall in Love" with what I have worked so hard to create. I appreciate you stopping by my website and hope you will call me with any questions. Havanese were created for companionship and are truly focused on us. In turn with their clownish, intelligent attitude you will fall in love with them as well. They are a small sturdy dog, quick thinking and funny. I'm sure you'll enjoy every minute with your new Havanese baby. Silver Harbor Havanese puppies are happy puppies which are nicely socialized and are responsibly cared for - they have not been raised in a kennel or hidden away in a cage somewhere. We handle, love and play with our pets and their babies. As they grow we socialize our puppies with all pets here because the puppies learn so much. We want the best for them and we hope you find a life long friend in them. Silver Harbor Puppies enjoy a balanced family dog lifestyle. They enjoy our family life. They go to bed when we go to bed and wake up with us in the morning. It's all a typical day and when age permits it's off into the play yard where they are introduced to Newspaper potty training and solid food. (We use a premium high quality dog food which I will send home a sample of). * Silver Harbor Havanese puppies have a great record of doing very well in potty training and they will prove to be better family dogs too. 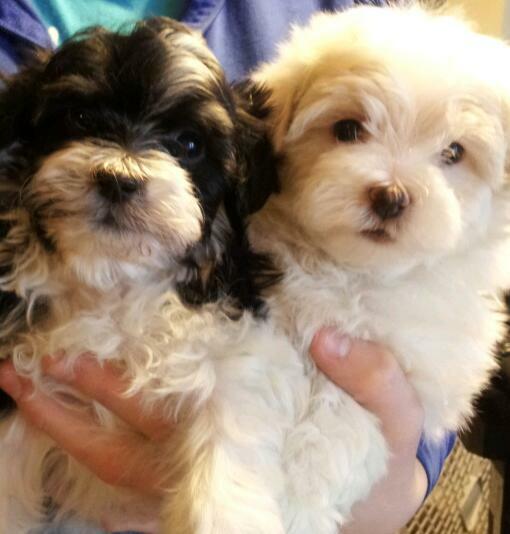 * All Silver Harbor Havanese puppies are health guaranteed and Veterinarian approved. * Choose a Silver Harbor Havanese puppy. It is the best choice and a great family investment. No breeders please. I only sell with limited or NO Registration. All parents are AKC or CKC registered dogs. All are healthy, veterinarian checked and up to date on shots, and preventatives. We offer a One Year guarantee for all of our healthy, happy puppies. AKC is an abbreviation of registration known to be American Kennel Club. CKC is an abbreviation of registration known to be Continental Kennel Club. I will accept a verbal request to HOLD the puppy of your choice for 48 to 72 hours however, if deposit is not received unfortunately I will not be able to continue to hold the puppy from other prospective buyers. All deposits are $200 minimum and are not refundable. "Peaches is now Madeline, and she is settling in great.... She is proving to be very adaptable as she accepted our two Shih Tzu’s almost immediately.... Having her paper trained when she arrived sure turned out to be a blessing. We are now letting her go outside with the other dogs and she goes to the bathroom almost immediately....We think she will be a very trainable dog. We enjoy her very much." Our Silver Harbor Puppies are quality bred puppies! All parents are my house pets and are Kennel Club registered. Silver Harbor is well known for quality bred puppies in excellent health and raised ONLY in a pampered home environment. Our puppies are also newspaper trained which provides better potty training habits, and a healthier environment too. Buying a Silver Harbor Havanese Puppy assures you are purchasing a happy, healthy, fun loving puppy. I also offer a One Year Health Guarantee on all of my puppies promising they are free from any genetic faults or genetic defects. You'll find Silver Harbor is one of the best possible homes to purchase your family friend. Thank you for your interest in Silver Harbor!